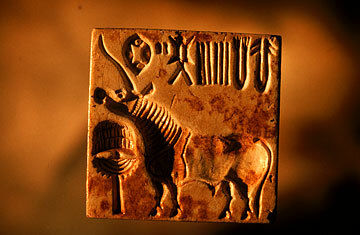 The ancient cities of the Indus Valley belonged to the greatest civilization the world may never know. Since the 1920s, dozens of archaeological expeditions have unearthed traces of a 4,500-year-old urban culture that covered some 300,000 square miles in modern-day Pakistan and northwestern India. Digs at major sites such as Mohenjo-daro and Harappa revealed a sophisticated society whose towns had advanced sanitation, bathhouses and gridlike city-planning. Evidence of trade with Egypt and Sumer in Mesopotamia, as well as the presence of mining interests as far as Central Asia, suggests that the fertile Indus River basin could have been home to an empire larger and older than its more famous contemporaries in the Middle East. But the Indus Valley civilization poses an intractable problem, one that legions of archaeologists and scientists have puzzled over from the first excavations to a new study published last month. Its writing, etched in signs on tiny, intricate seals and tablets, remains undeciphered, shrouding the ancient culture in mystery. A code-busting artifact with bilingual text, like the Rosetta stone, has yet to be found. By some counts, more than 100 decipherments of the civilization's often anthropomorphic runes and signs  known in the field as the Harappan script  have been attempted over the decades, none with great success. Some archaeologists spied parallels with the cuneiform of Mesopotamia. Others speculated an unlikely link between Harappan signs and the similarly inscrutable "bird-men" glyphs found thousands of miles away in the Pacific Ocean on Easter Island. In 2004, perhaps out of befuddlement and frustration, a group of scholars declared that the script marked only rudimentary pictograms and that the Indus Valley people were functionally illiterate. That hypothesis, which caused a minor uproar in the world of Indus Valley researchers, was recently rejected by a team of mathematicians and computer scientists assembled from institutions in the U.S. and India. That team's study, published initially in April in Science and more extensively in August in the Proceedings of the National Academy of the Sciences, employed computer modeling to prove that the Harappan script communicated language, and has reinvigorated attempts to crack what is one of the lingering puzzles of ancient history. The group examined hundreds of Harappan texts and tested their structure against other known languages using a computer program. Every language, the scientists suggest, possesses what is known as "conditional entropy": the degree of randomness in a given sequence. In English, for example, the letter t can be found preceding a large variety of other letters, but instances of tx and tz are far more infrequent than th and ta. "A written language comes about through this mix of built-in rules and flexible variables," says Mayank Vahia, an astrophysicist at the Tata Institute for Fundamental Research in Mumbai who worked on the study. Quantifying this principle through computer probability tests, the scientists determined that the Harappan script had a similar measure of conditional entropy to other writing systems, including English, Sanskrit and Sumerian. If it mathematically looked and acted like writing, they concluded, then surely it is writing. But this is just a first step. Vahia and his colleagues hope to piece together a solid grammar from the sea of impenetrable Indus signs. Their August paper charted the likelihood of certain characters appearing in parts of a text  for example, a fish sign appeared most frequently in the middle of a sequence and a U-shaped jar sign toward the end. Bit by bit, the structure of the script is coming into view. "We want to find the bedrock against which all further interpretation of the language should be checked," says Vahia. Down the road, he imagines he could write in "flawless Harappan"  even though he may have no idea what the assembled sequences would mean. Rajesh Rao, an associate professor of computer science at the University of Washington and a co-author of the study, says the task ahead of them is "like a jigsaw puzzle, one where you try to fit meanings into patterns and sequences." At the moment, he and his team are wary of ascribing meaning to the signs  an act of conjecture, he says, that has led other Indus Valley experts in the past "to go too far." It doesn't help that, though long dead, the Harappan script sparks sometimes acrimonious debate in India over the nature of its origins. Scholars from southern India claim it ought to be linked to proto-Dravidian, the progenitor of languages like Tamil, while others think it is related to the Vedic Sanskrit of early Hinduism, the ancestor of Hindi and other languages spoken in India's north. And while cultural agendas within India have stymied collaborative efforts, the enmity between India and Pakistan has impeded archaeological breakthroughs. Ganeriwala, a desert site in Pakistan that possibly holds the ruins of one of the civilization's biggest cities on record, has yet to be properly excavated because it sits precariously along the heavily militarized border with India. More the shame, says Bryan Wells, a senior researcher at the Institute of Mathematical Sciences in Chennai, for solving the riddle of the Harappan script needs the involvement of people from all backgrounds. Wells, who was not part of Rao and Vahia's team, spent 15 years painstakingly examining the disparate body of Indus Valley artifacts and compiling what is now the largest database of Harappan signs  676 in total. Even though no one knows the root language behind the script, he reckons greater cooperation and a monkish devotion to the task can slowly unravel more secrets. Wells and a colleague have already made significant progress in decoding the Harappan system of weight measurements. "What you need is to keep an open mind, form a good idea and have others break it apart and expand it," he says. That process of careful scientific analysis and scrutiny will take years, probably decades. But it would be worth the wait. Scholars aren't even sure how this enigmatic civilization disappeared. Was it eradicated by conquest or washed away by floods, or did its people just blend into other migrations settling the Indian subcontinent? Although Harappan cities were vast  Mohenjo-daro could have been populated by as many as 50,000 people, a staggering figure for such deep antiquity  they have left behind few towering monuments or epic ruins. Instead, we have clues in miniature, a copper figurine of a mercurial dancing girl, for example, and a treasure trove of delicately carved seals, most no larger than a postage stamp. "They are a window into how these people were thinking," says Vahia. "And they can tell us, in a sense, why we are who we are."